Download SQLyog from Download Page. Execute it and follow the steps to install the program. The installation and registration are possible with a silent installation. Once you start SQLyog, you will get a figure as shown below. 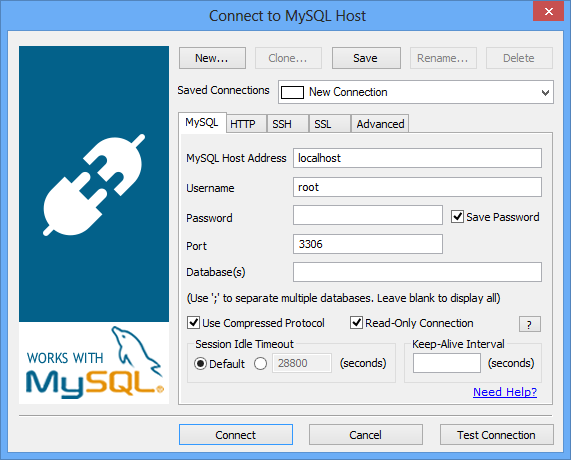 The connection window allows you to connect to the MySQL server. Direct connection using MySQL C API: This is by far the fastest way to connect and manage your MySQL server. This is the preferred method if you are not concerned about your MySQL traffic being spoofed. However, this requires direct access to your MySQL server. Most ISPs block the MySQL port or disallow remote access. SSH Tunneling *: Use this option if you need to encrypt the contents of your MySQL traffic, but still want the efficiency of the MySQL C API. If your host supports SSH tunneling, SQLyog can use the tunnel to communicate with MySQL. HTTP Tunneling *: This option saves your day if your ISP/MySQL provider disallows remote access, either by blocking the MySQL port or by giving access to “localhost” only. The response is slow compared to the previous options since the data is XML encoded and HTTP is stateless by nature. However, you can use all the cool features of SQLyog (and start getting more sleep!). SSL Encryption *: With this option all communication between SQLyog and the MySQL server is encrypted. The MySQL server must support this option. Not all servers do! To get more information on how to connect using your preferred method, click on one of the topics below. *: This feature is available in SQLyog Professional, Enterprise and Ultimate. New- Click the new button. In the name field (figure shown right) type the name by which you will recognize the connection. By default SQLyog will create an instance with default values (e.g. localhost, root). Save- This button allows you to save any change in the connection details. Click this button to Delete the currently selected connection. Click Yes to Delete. Rename- Click the rename button to rename a connection. Note that Connection Names are names used internally by SQLyog only (and not MySQL). Connection Names are used by SQLyog for storing the connection details. Also, certain SQLyog functionalities will make use of the connection name as stored by SQLyog.